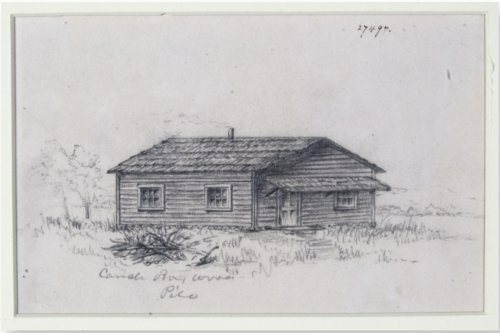 This pencil sketch on paper depicts a log cabin near a woodpile and is captioned "Candle Box Wood Pile." During the turbulent era of Bleeding Kansas, this cabin in Lecompton was the office of the Surveyor General, John Calhoun. Calhoun received election returns for the Lecompton Constitution at this cabin, and was accused of hiding the returns inside a candle box in the woodpile. The sketch was made between 1858 and 1894.